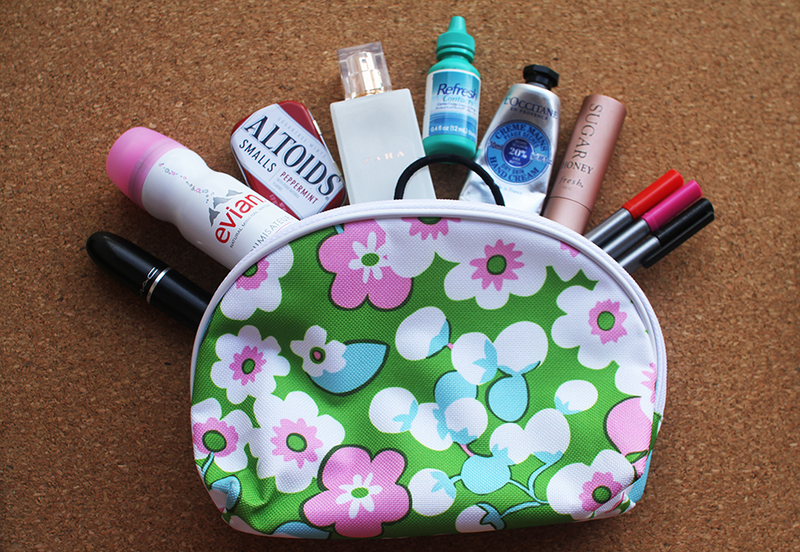 Lovely post:)I have never seen what in my bag on a blog,thanks for sharing:) So many helpful products! I love keeping snacks in my bag its always better to have something than having to buy something! Nice!! I love your backpack! Great idea that notebook! Everyone seems to have a Mac lipstick. I really should try it! I love these kind of posts myself! It's so fun getting a look into peoples private bags :) So cool, thanks for sharing. love these sort of posts as well, your backpack is so cute! I always keep a notepad and pen in my purse as well. You never know when inspiration may strike! I love those "what's in my bag" posts too! Partially because I'm just nosey by nature and love seeing what other people carry around ;) You look so prepared with all of your cute little travel items! I love those little altoid cases, btw! After they're empty, you can put pills or vaseline in there for on the go. Currently I have 3 rubber ducks in my backpack with a ton of chocolate coins and reciept paper hahah I'm probably not the ideal candidate for these posts. Hope you're having a great weekend so far! I love your tory burch backpack. I have evian as well as the weather here in UAE is mostly humid. 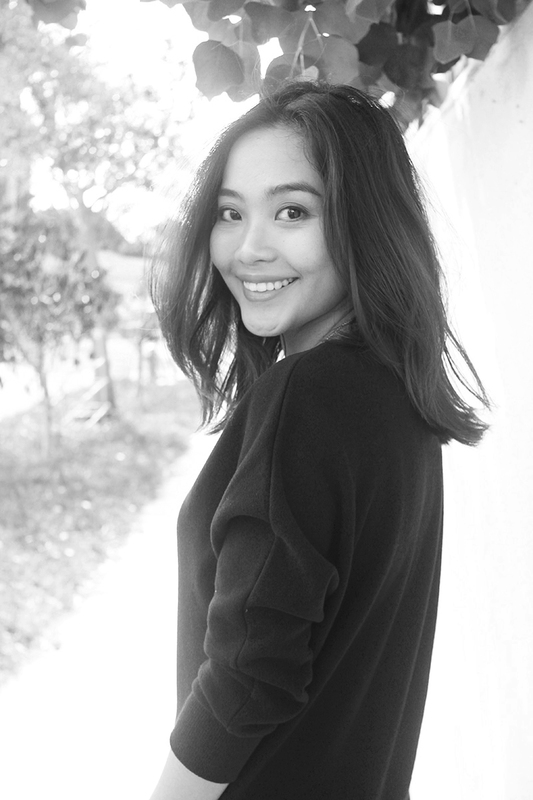 Low maintenance style and beauty is key :) Thank you for sharing Trang! Can't agree more that a face mist can perform such miracle :)! Thanks for sharing! I love this kind of post, because it's so interesting to see what other girls are holding in their bags. Had a lot of fun reading this and your bag is so pretty! I love these posts as well! I'm so nosy when it comes to seeing what other people carry. I usually have a ton of lip products, and in the summer I have the evian facial spray as well! I love your TB backpack! I love watching what's in my bag videos on Youtube. I like that you carry snacks, clever for daily cravings! I love getting to peak inside of what people carry with them in their bags. Love that you have a bag of snacks with you. Not a bad idea! yes to face mists! i justtt finished my avene one this morning so i'm on the hunt for another! will have to try out the evian one. 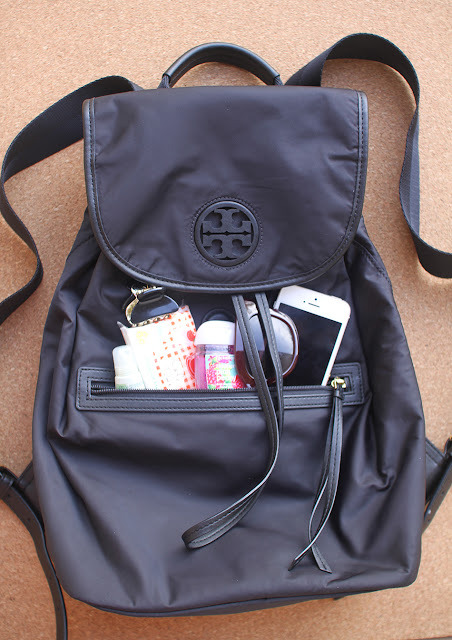 I also love to see what people carry in their bag!And yours is so organized! Thanks for sharing! Your backpack is so beautiful! What a classic piece. I've heard great things about face mist--I should really give it a try! Carrying snacks is such a great idea! Don't worry, I have a plethora or gum wrappers and receipts floating around in my bag! Cash for tips because I want to tip people cash rather than credit cards. --> this cracked me up haha! I love your backpack by the way! Have a great day Trang! 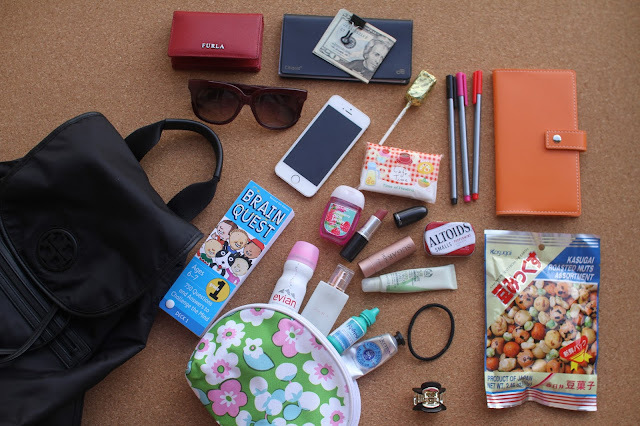 Thanks for sharing what's in your bag! I tend to keep a lot of lipstick and Chapstick with me at all times, a pair of sunnies, my cell phone, wallet, hand sanitizer, and a small mirror. I need to pack my lipsticks and beauty essentials in a bag like you. Fun to see what you carry. I still love "What's In My Bag" posts. I love your Tory Burch backpack! Thanks for sharing! Wow, you are so organized! Great post! I totally agree--you can always tell so much about a person from what they are carrying in their bags! And by the looks of yours, you seems so prepared! I love that you carry cash for the purpose of giving tips--that's so kind! Love this! Brain quest!! I totally forgot about those - what a reminder of my childhood! I love "What's in my bag" posts and I must say: You are very organized! LOVE it! I'm the same as you, a lipstick and perfume MUST be in my bag and wet wipes and lip balms too! I like these posts too. You really get to know someone through the items they carry and the reasons why they like them so much. Great post. If i were to do this, it would pretty much consist of a truck load of lipsticks, haha. great post and awesome blog!! I love seeing what in other people's bags. I like your bag-within-a-bag for toiletries and beauty, I have one myself and it's so useful! I wish my bag were this organized! Lol! I love this kind of post. My whole bag is trash on most days! Your bag contents are too cute! I love the little beauty items and the carrying case. Very nice! Love to see what other people are carrying around on a daily basis. I have a rather small messenger bag style, enough to fit my wallet, phone, hand sanitizer, sunglasses, keys, kindle or a book I am currently reading, lipstick and... I guess that's it. I don't carry a lot of stuff around. I love Fresh lip balms and MAC lipsticks! Mình thích tờ 50$ xanh xanh hihi. Love the backpack! Great tips!